When did I last wear it? Do I look good wearing it? Is it falling apart? If you answered no to any of these questions, or stood and pondered your answer for more than five seconds, then discard the item into the rubbish pile - it doesn't need to be a part of your new and improved spring wardrobe! The key to this tip is to be brutal with your decisions. I like the next person get attached the clothes and often utter the sentence: "But I might wear it one day!". Almost always this will never happen and it will just be taking up valuable space in your wardrobe that could instead be filled by that sheer blouse or maxi duster coat you've been eyeing up on ASOS. This is a key tip when having a wardrobe detox. It's all well and good getting rid of old items but if you then proceed to throw everything back in willy nilly you'll be left with just as much mess as you had to begin with but with fewer items! 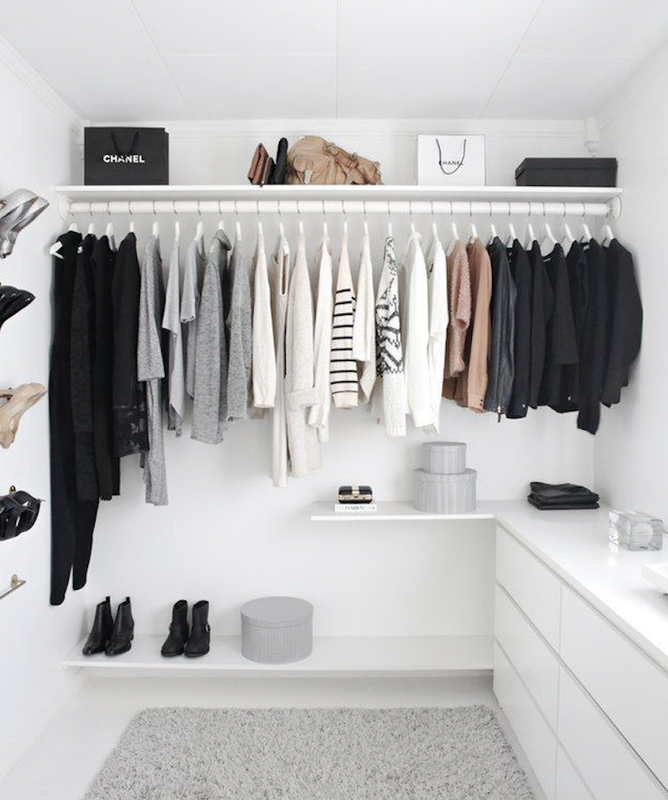 Obviously depending on the size of your wardrobe the way you organise your clothes will vary but for me, I have three wardrobes (and still not enough space for everything!) so I find it easiest to have one for coats and bags, one for spring/summer pieces and one for autumn/winter pieces. I then tend to organise things by the type of item, so for example all my shirts sit together - in colour order - all my bottoms and all my t-shirts etc, you get the picture. This just helps me when piecing together outfits as I know exactly where the item I'm looking for is rather tun having to rummage round for ages. I also don't fold anything, except pyjamas but they don't really count. This just leaves things creased and means you can't really see what the times are anyway; stick to hanging everything up if you can. Once your wardrobe is cleared out and re-organised, you can finally see what pieces you are lacking and what you actually need to buy. This obviously helps keep clutter down but it also helps with curbing spending habits and I know that's something I personally, definitely need to do. You can see exactly what pieces are missing, lacking dresses or basics, and then can tailor your shopping to just trying to find the key pieces to complete your seasonal wardrobe. So there you have it, a few hopefully helpful tips to detox your wardrobe ready for spring (or any season really) and now you're probably thinking: what do I do with the multiple reject piles all over my room? Sites like Depop and eBay are a great way of getting rid of slightly newer or better quality items, while car boots are a quick and pretty stress-free way of ditching those slightly less desirable items! Lovely tips! I need to spring clean my closet! Thanks for the inspiration! Greets, Enfield Wash Carpet Cleaners Ltd.
Glad the tips were hopefully helpful for you, hope your spring clean goes well!